Join us in welcoming John McEuen of the Nitty Gritty Dirt Band back to the Hideaway Cafe stage on Sunday, January 6. Joshua Reilly will open up the show. Doors open at 5. Show starts at 7. 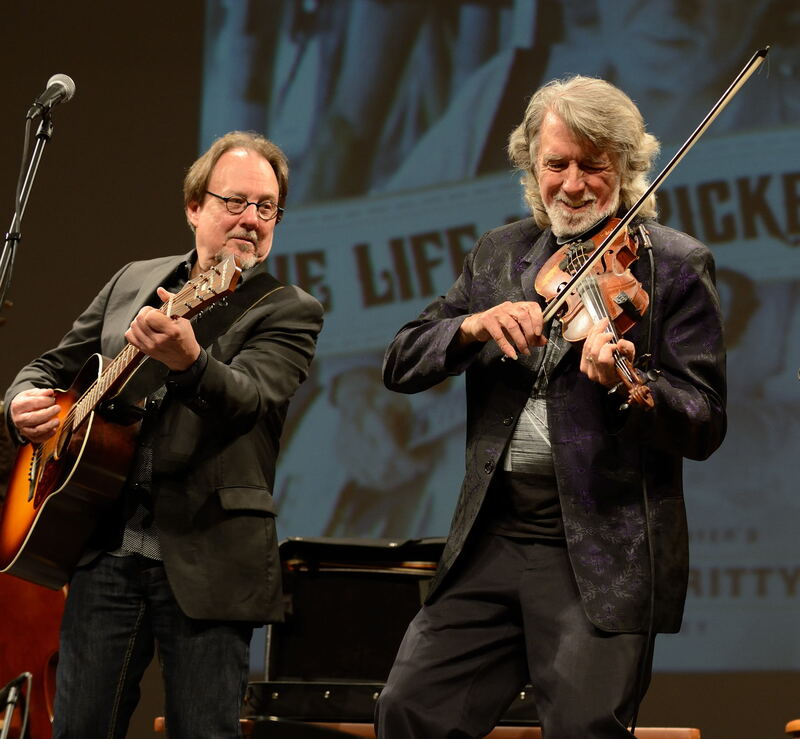 John McEuen, a founding member of the Nitty Gritty Dirt Band and multiple Grammy winning artist, returns to the Hideaway Café with his banjo, guitar, mandolin, fiddle AND a special guest –NGDB alumnus, John Cable. (Cable was in the band when they became the first American band to tour the Soviet Union in 1977). Playing a broad spectrum of roots, bluegrass and music now called Americana, multi-instrumentalist McEuen says “after doing 100 dates around the country last year it is great to start the year close to home in one of my favorite clubs. The sound at the Hideaway is great, and it is a place to try out a few new songs and dig up some old NGDB ones you have probably never heard.” An established name in acoustic music, his production of Steve Martin’s The Crow won the Best Bluegrass Album Grammy, and McEuen was recently was honored with the “Best in the West” solo award from the Folk Alliance. Also joining this unusual night will be new hot picker Florida mandolinist John Hoover. John and Hoover have musically met at McEuen’s music parties at his Manatee River lodge. Also, harmonica legend T.C. Carr says he is dropping in for a few of the blues tunes – as well as some bluegrass harp like no other can do. McEuen has made over 35 NGDB albums, including the landmark platinum-selling Will The Circle Be Unbroken he initiated following his teenage dream to “someday record with Earl Scruggs” (see the video link* to see that first time they met, in 1970 backstage in Nashville). Dolly Parton, Steve Martin, Willie Nelson, Bill Wyman, Johnny Cash, June Carter, Jerry Garcia, Phish, Jerry Jeff Walker, Kevin Nealon, Alison Krauss, Bill Cosby, Stephen Wright, Mark O'Connor, Tommy Lee Jones, Sissy Spacek, Linda Ronstadt, Leon Russell, Little Richard, Maybelle Carter, Levon Helm, Kris Kristofferson, Bob Dylan, Kenny Rogers, Steve Vai, Doc Watson, Jimmy Buffet, The Smothers Brothers, Rowan & Martin, Mary Chapin Carpenter, Alan Arkin, Bobby Sherman, Jose Feliciano, Allman Brothers, John Denver, Roy Acuff, Earl Scruggs, Jack Benny, Glen Campbell, Steve Goodman, Waylon Jennings, Robin Williams, Little River Band, The Band, Marshall Tucker Band, Big Head Todd and the Monsters, Doobie Brothers, Andy Williams, Merle Travis, Vassar Clements, Dizzy Gillespie, The Osmond Brothers, Everly Brothers, Crystal Gayle, Gary Morris, Doug Kershaw, Michael Martin Murphey, The Doors, Donovan, Lee Marvin, Ramblin' Jack Elliot, David Amram, Arlo Guthrie, America, Bill Monroe, Asleep at the Wheel, Aerosmith… and others.